• Please do not steal the concept or art of Dinoken. • Please do not spam or minimod. • Please do not enter competitions after they have been closed. • You may own as many dinoken as you would like. • You may not alter your dinoken appearence. • You may not make your own dinoken if you do not have permission. • Staff should compose themselves in a mature, and unbiased manner. • Staff are to be respected by the community. Artists must create one batch per month. Archivists must update the archives at least once per month. Mods must be active during the month. • Inactive staff will be given a warning after a month of inactivity, and will be removed within the two weeks following that warning if they do not respond and there was no prior notice to explain their inactivity. • Staff recieve one MYO for every month of activity. • Staff recieve one personal batch every month of activity. • Dinoken are never to be used as “fodder” for trading. Please only make trades that you are sure that you want to participate in. • Dinoken may only be traded for other dinoken or dinoken items. You may not trade dinoken for CS pets, C$ or other currency. • The archivist must be notified of all trades through the archive update thread before the trade may be deemed official. • Users who participate in a trade have a strict cooldown of one month before they may trade again. • Only two way trades may occur. • Gifting is one way and may not be reversed unless both parties agree. • Gifting may occur once per month. • The archivist must be notified of all gifts through the archive update thread before they may be made official. 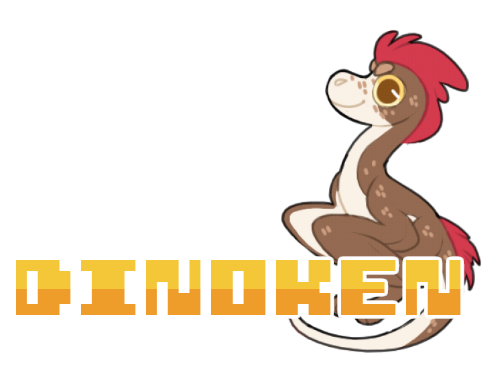 Are you interested in joining dinoken staff? Well here's your chance!! Guest artists have their position for a week. They may make up to 3 batches, each containing up to 5 dinoken. After their trial period, they may be hired as a full time artist! If you do not get hired, you will recieve 1 MYO dinoken for your work! Archivists keep track of the adopts in the species and who they belong to. An archivist would be responsible for creating a regular adopt archive, as well as a custom/myo archived if they so desired. Archives can be created on CS or google docs, whatever platform you prefer. Mods are in charge of cleaning up the threads and making sure that everyone is following the rules! They can also approve custom dinoken and assign roles in the discord. Moderators must be consistent and unbiased in their judgement. Please post applciations on this thread! Check out these awesome stamps made my one of our mods, The Writer! Here you can get brand new Vimeria! They might be a child, or maybe an adult! Might be dark and grunge-y or a bright neon-eye-burner! Who knows! You get up to 2 rolls a month. They can be done at the same time, or at different times of the month. You can choose to not keep the gacha you get, and it will then go up for readoption. If you choose to give the gacha to someone else after you accept ownership of the gacha, it will fall under the "must be owned for 1 week before it can be traded" rule! Purple - 40% (1-40) - an unedited vimeria, or one with any amount of no-rarity traits! Pink - 25% (41-65) - a vimeria with any amount of common traits! Yellow - 20% (66-85) - a vimeria with any amount of uncommon traits! Green - 10% (86-95) - a vimeria with any amount of rare traits! Red - 5% (96-100) - the rarest, a vimeria with a legendary trait! You always have a chance to roll for any color in every roll, but paying extra can guarantee you a rarer color if you don't trust your luck! Send your payment for the machine to Horror with this form in your message to take a roll! Welcome to the Adoption thread. A Tarren's appearance and behavior is like a cat, but they are more closely related to canines. Tarren have sharp teeth for tearing flesh. 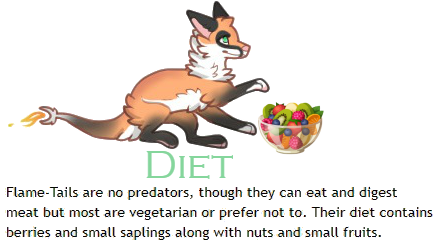 Though their diet consists of mostly meat they have a distinct liking to fruit and fish of all types. After every meal Tarren clean themselves up by licking their coat to keep it shiny and clean. Their saliva contains a type of water proofing oil that protects their coat and keeps them from getting excessively wet in the rain. Tarren have been known to avoid water. A Tarren could potentially drown when swimming for to long due to their thick fur. This doesn't mean Tarren stay away from water entirely, they are often soaking in the shallows to cool off and are considerably good swimmers. Even though Tarren have thick coats, during hot days the fur holds very little heat. Once the environment cools off the fur grows a type of undercoat to keep the Tarren warm. They are usually very fluffy during this time. Tarren are surprisingly social living in groups up to 10-30 members. These groups are called Gangs. When a gang of Tarren run into another gang they normally have very little conflict and are happy to share with one another. When hunting, the gang will work together to bring the down the prey then share the food among the group. They hunt in the morning when it's cool and will travel up to 20 miles tracking or chasing down their prey. Tarren have four eyes which aid in hunting. The eyes can not move individually on their own, instead, much like canine eyes they move together. Tarren see in color and can detect movement from a mile away. In addition they have extraordinarily large ears with excellent hearing. They can hear cries from one of their own kind from 5 miles away. Most old Tarren lose their eyesight, once this happens they use their echolocation in order to see. When Tarren are born, they have thick wiry hair down their backs. As they get older this hair falls off. Vixens (female tarren) can have up to 24 skimps (babies) in their life time, usually having 1-3 skimps per breeding. Brutes (male tarren) can breed 8 times in their lives. Some Tarren mate for life but most do not. 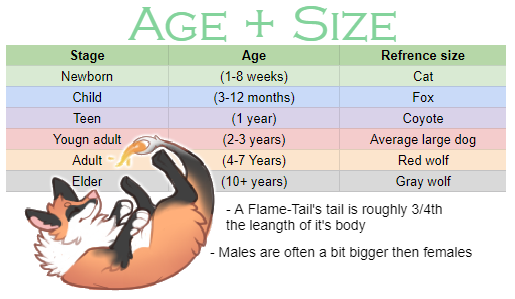 - Length (shoulder to rump) Minimum 3' 5" Maximum 6' 5"
- Tarren can live up to 40 years old. - Speeds up to 70 mph. - Adapt to different climates easily. - Fill out a forum to adopt a Tarren. The form will be placed on the one you wish to adopt. - you can own up to 20 Taurens. - After 2 weeks you can breed a Tarren, they have 8 breeding slots each. - In case one or both Tarren you plan to breed aren't yours, you’ll have to ask for the owners' permission and show it to the artist you want to order the breeding from as a quote. - You can only order when the artist publicly announces they are open for it. - Tarren only have 1-3 offspring at a time. - Don't claim species as your own. - Don't ask for contests, customs, designs, breedings, etc... on this forum. Thats on the Fan Club thread. - Don't complain if you haven't won one yet. - Posting for this thread for a Mark is ok. Advertising for other species is not. - Be kind to other contestants and be a good sport. - All CS rules apply. - Don't copy other contestants forums. - You may try out for as many as you like! - Please dont change the format of the form, so color changes, centering, size changes, etc. Thank You! DESIGNS - (c) to respective artists. also i'm kind of tempted to keep 4 and 6 but we'll see if that'll be the case still after their designs are done..
🌸CUSTOMS ARE 2C$ ((((you can offer pets and stuff too)))) Fill out the form and feel free to add as many photos as you like! Extras? : Could they be pastel-themed please? Thank you! Many thanks to Sixbane for the revamped lines! Snow Cat Adoptable Rescue (hereafter called SCAR) is a character development centered species. The goal of these little guys is to work on character development, though worldbuilding is encouraged as well! What is a Snow Cat? Well I'm glad you asked. A Snow Cat is a cat-like creature with a long tail and thick fur. They live in the snow, as their name suggests, carving out dens in the ice and often living in large social groups known as packs. The markings on a Snow Cat's forehead tells you their family clan. Each Snow Cat you adopt will have a unique marking, unless it is a cub you have bred, in which case the marking with be the same as its mothers. Snow cats are a closed species at this time. In order to get started with SCAR, you're going to need a Commander Snow Cat. Commanders are shown by a special marking that appears somewhere on their body after they have been ranked up, and vanishes if they are ever ranked down. Though you may set up the hierarchy of your pack however you like, you must have a Commander as the Snow Cat in charge. In order to get your Commander, you may do one of two things. You may redeem your free Snow Cat using the form just below, or you may adopt one through our normal means and rank them up into Commander position. To do this, you must not have a Commander form posted. In order to keep track of which Snow Cats you own, SCAR asks that you create a home for your pack to live in. Whether this is here on ChickenSmoothie, or on a CS-Approved site. Once you have your Commander, you will be given three weeks to create a home and level up. If at the end of two weeks you have not, a moderator will message you, giving you a reminder. You will then have one more week to finish the bare-ground tasks. If you still fail to do so, your commander will go up for public adoption and you will have to adopt a new commander if you wish to continue with SCAR. Everyone starts off as a Bare-Ground. A Bare-Ground is entitled to have a single Snow Cat, their Commander. In order to level up and be able to have more Snow Cats, you'll need to preform some tasks, simple things like creating personalities, or histories for your Snow Cats, in order to develop them. When you complete all tasks needed to level up, please post on the fanclub so that our archivists can mark you off. You don't need anyone to confirm you've marked up, but we will be checking every so often, and if we think you skimped on a task, we'll let you know, and your leveling up will be put on pause until it's fixed. ★ LEVEL 10 ONLY: You've come this far, and now it's time to say goodbye. Write the death of one of your Snow Cats. This Snow-Cat will gain a glow on their reference to depict death. Deceased cats can no longer be used for prompts, so choose wisely. You can of course 'kill' one of your SCs before this, and you can also do it after. Simply message the artist of the SC informing them that the SC has died. Be warned, you cannot bring a dead SC back to life! Once they die it is permanent, so choose wisely. ★ EVEN LEVELS ONLY: (10, 12, 14, etc) Collaborate with another user of any level in any form of your choosing. This may be used to bypass the Light-Snow task if your partner is Light-Snow level. ★ ODD LEVELS ONLY: (11, 13, 15, etc) Write or Draw a scene of your own SCs. ★ At any time: Now that you've made it to Golden Sky, congratulations! It's been a long journey. Now that you've made it this far, and proven yourself an active member of SCs, you can create a second pack. The Commander must be custom ordered, and you cannot have your original pack members move to the new pack without a good reason, that must be verified by myself first. This pack will also level up separately of Golden Skies. The requirement to make a second pack, is that you first have to make something for the community, for any SC user to use. Whether this be a banner, a stamp, or lines for the Oekaki. Like was briefly covered above, you can have custom Snow Cats in your pack. In order to obtain these, you may redeem your free Snow Cat if you have not done so for your Commander. You may also order them from our artists, each of whom have different prices that will be listed below. In order to keep from exploiting, you must wait a minimum of three weeks before trading or selling your Snow Cats. If you wish to trade or sell, you and your partner must confirm the transaction on the Snow Cat's page. It is up to you how much to sell your SCAR adoptables for, but once a trade has been confirmed and completed, it may not be undone without both parties approval. In order to keep from exploiting, you must own a Snow Cat for two months before you gift it, and you must wait three months in between gifts. The exception is if you are disbanding your current pack, in which case you may gift all of your existing Snow Cats to people (they must confirm accepting before the gift is complete) and fully restart, but you must wait six months in between disbanding and rebanding your packs. If you are recipent of a gift, you will be alerted via PM that the prior owner wishes to Gift their Snow Cat to you. In order to accept, you must post on the Snow Cat's original page confirming that you have accepted the gift. If you do not do so within wo weeks, the gift will be considered void and the owner will be able to offer it to a different person, or in trade. This is the only way to cancel a gift, so be absolutely sure you want to get rid of your cat before you do so. Welcome to Back in Business! This is an adoption-type game that encourages the use of characters you obtain through here! Be sure to read up on the rules, and all of the information regarding getting your founder! This is still a BIG wip! 2/9/19: Getting the thread started up! I might have artist searches later in the week. -All prompts must be CS appropriate! -Threads/sites must be made within the month to keep your founder ferret! -If you run out of space, you must level up ASAP! -In some cases, ferrets may be readopted, such as being banned from ChickenSmoothie. -Mutations (like Albino ferrets) and physical disabilities (Blindness, Deafness, missing limb, etc.) will not be available to get as a founder ferret, and they typically won't be available for regular adopts. For any physical disability, that would need to be rolled for as a scar. -If a ferret is gifted to you, you may only gift or readopt it. -Please follow the same rules as above! -Try to judge prompts asap (let me know if you can't judge within the month). -Whenever you make a ferret, just put a basic description where you can! Just thought I would highlight some info in the event someone didn't see it. To claim a founder, fill out the forum below. You can choose to leave parts empty to get a randomized ferret! All levels will have certain goal you need to reach before leveling up. For your convenience, I turned each of the levels into a checklist that you can X out as you complete! You won't have to wait to start leveling up more, but if the response doesn't fit the prompt somehow, or meet a requirement, I'll message you and let you know. Thanks to Toomin and Zippo. for helping with goal ideas! All of them are 10C$! I'm also willing to accept pet offers, just ask! Glossy boi // Eevee Haven Starter based on this drawing by Maxwell. Thank you for letting me colour your new fox babs! Avune Wolves, shortened by some to Avune, are a species of wolf known to collect small items such as journals, plants, gems, and shells. Items are chosen at birth and must be kept within 6 feet of them or face death. This item is their lifeline and is always something they value. There is a very rare mutation which allows the Avune to have no item, making it immortal. Avune Wolves are commonly used for finding certain objects, as, with their connection to their own items, allow them to find others. An Avune may have up to two items, so to get the job as an object seeker, the Avune must either be a newborn (so it could find two items) or an Avune with only 1 item. Objects have certain rarities depending on them. You may see the object chart down below. Small single objects. ONE stone. ONE book. Small plural objects. 2-3 gems. 2 daggers. Large single objects. Newspaper. Laptop. Multiple object (small-big). Example: A laptop and a keychain. A knife and a snowglobe. If an artist wishes to open customs, they shall post on this thread opening a slot. Customs will be posted on the CUSTOM THREAD. You may get one custom per month. Custom rarity will be determined by payment to artist. An artist may only open 4 slots per month, with no mutations higher than rare. Custom forms will be provided by artist and will most likely be fcfs if the artist decides the first post is a fair payment. Happy Easter! in honor of this Holiday the FTV center will be hosting its own Per-Release Easter event! None! Let's Keep it that way! I’ll be using a raffle to decide the winner of this worm. I’ll probably post the winner after a page or two. Fill out the form below to enter the raffle. Username: you should know me by now, but it’s bonding.moment just in case you forgot. Please refrain from sending unsolicited offers or messages to Rise members about buying their cats. Also please see our new rule announcement on page 280. • Please be nice and do not pester Rise staff. Respect all others. • Negativity/harassing behaviors will not be tolerated. • Art/writing used for Rise must follow CS rules. • Give credit to the artist for the design. • Rise characters must have realistic designs. • Do not change Rise designs. » includes adding scars, accessories, changing fur length, etc. • You will not be added to the original images. • Rules may be changed as I deem fit. • You may only have one clan. » As of 1/27/19, you may now have a second clan when you reach level 10. See "Step Four"
• Your clan may only contain your own cats and the cats must be official Rise cats (not OCs). • You must maintain a thread/website for your clan. • If you do not make a thread for your clan, get to level 1 and post on the archive to confirm this within a month, your cat will be rehomed. » This does not apply to COPPA members, as they can't post on the archive thread. • If you are banned from CS, your cats will be rehomed within Rise. » You may NOT keep using the official Rise reference art in any capacity. » Your cats will be marked as deceased within Rise. • Do not repost founder forms. • You may only redeem your free founder once. » If you do not claim your founder and it gets rehomed, you may only get another Rise cat through adopts or a paid custom. » If you rehome your founder of your own accord, you may only get another Rise cat through adopts or a paid custom. • You may order 1 custom maximum per month. Customs reset on the first. • Transfers/salesbetween Rise clans are allowed. » When transactions are made, both parties must post on the cat’s thread. » The original owner must post an amendment on the archive thread. » Deceased cats cannot be included in transactions. 4/15/19 wrote: Previously, bred kits have been allowed to be sold, traded, or gifted immediately after being posted. Now, bred kits posted as of today may only be gifted immediately after being posted. They may not be traded until the 2 month cooldown is over. Previously, we have allowed members to trade, gift, and sell living cats within Rise. Now, cats obtained by any means before this date may be sold, traded, or gifted. Cats obtained by any means after this date(4/15) may only be traded or gifted. Accepting payment for a Rise cat will result in an immediate ban. To Clarify: The rule comes out today. User 1 wants to sell a cat they got at least 2 months ago. They can, so they sell it to User 2. User 2 can't sell it since they obtained the cat after the rule was made. » You may NOT give away the official reference artwork. » You must alert Dia. so that the character can be labeled deceased within Rise. » You may NOT use the official Rise art outside of Rise. » If you want to use the character elsewhere, you must use different art. • Cats labeled deceased within Rise may be used as a character outside of Rise. • You must submit a form in the archive thread to kill off a cat and have it marked deceased in Rise. » Cats will not die or lose lives unless you specifically request it in the archives. • Deceased cats do not count towards your cat limit. • Additional scars must be earned through a form/ticket process, typically on the archive thread. • Deafness/blindness tickets may be earned similar to scars, typically on the archive thread. » 1 custom cat for themselves upon hiring. » Adoptables only, NOT customs or founders. » 1 custom cat fore themselves upon hiring. » 3 custom cats for themselves yearly (every 4 months) provided that they are active. » A special birthday custom, provided that they are active and confirm the custom with Dia before posting. 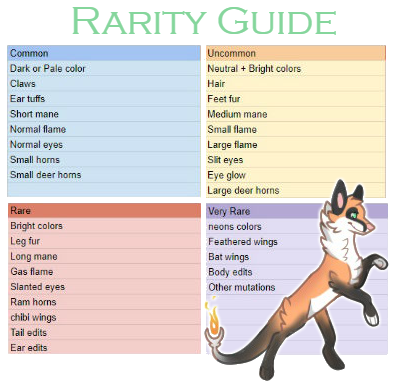 » Adoptables, paid customs for others and free breedings. » Be active and produce realistic, quality designs. » They will be removed if they are inactive without communicating with Dia. » Make all adopts on oekaki canvas. » Add scars and such to designs at will. » Ask for payment for customs. » Using only the custom payment agreed upon by staff. » Open up to 5 custom slots at a time, no more than 2 times a month. » Complete orders in a timely manner. » Custom orders should be completed in the same month that they are ordered. » Judge competitions within a month. » Dia. will take them over if you fail to judge them. » Discuss awarding a RU with the rest of staff, if they would like to award one. » A decision will be reached in 24 hours. » Let Dia. know if you want to make a milestone adopt. » Ask for payment for breedings. » Make extensive lineart edits or rare conditions without Dia. 's permission. » Ex: missing limbs, short limbs, hairless cats, male calicos/torties, etc. » Promise a RU before a staff decision has been reached. Ex: Don't start or close a competition saying there will be a RU. » Take more custom orders before previous orders are completed. » Open / accept customs during the last week of the month. » You can either get your founder through normal adoption processes, or you can get it custom made by one of our artists for free. » To redeem your custom founder, please fill out the form below. An artist will claim it and create it for you. » You may only redeem your free custom founder once, even if you do not like it, do not claim it, or trade it away. » You may request small scars to be added to your founder. » Do not request specific breeds or lineart edits. » Your thread can be set up however is easiest for you. » You may use another site such as deviantart, toyhouse, your own website, etc to store your clans as long as the site does not contain content that is not allowed on CS. » No personal information, inappropriate language, etc. » COPPA members are exempt due to their restrictions. » If they'd like to participate in Rise after they have their restrictions lifted they should make a thread and post in the archive ASAP. » Please do not store Rise cats in RP Character storage. Step Three: leveling up; don't worry, it's easy and fun from here! » You start off at Level 0. » You are able to level up and grow your clan by completing world building and character development tasks. » Post on the archive thread to level up your clan. » You do not have to wait for confirmation that you leveled up. » However, you will be contacted if your level-up tasks do not fulfill the requirements. » When you reach level 10, you have the opportunity to develop a second clan! » Each task must be completed before you can get to the next level. » Only the high ranks are limited. You can choose what ranks your other cats are. » Ideas for prompts can be found in the fanclub. » Drawn scenes should be at least flat colored. » Characters must be recognizable. » Character art should be at least a flat-colored headshot. » Written scenes should be at least 200 words. » Tasks fulfilled through an RP must include 3 posts from each party, and each post should be at least 100 words. » The RP posts should be linked to or logged on the clan thread. » Other minimums will be listed with the tasks. » If a cat comes to your clan as a kit or an apprentice, you can ask the artist to age them up for you. » The artist who made the kit is the only one who can do that for you, since the adult version will be saved in the kit's file. » The adult art will be posted as a new drawing underneath the kit drawing so that you can keep both versions. » It is completely up to you how long you wait to age your kits up, but there are minimum requirements. » You must wait at least two weeks before requesting the adult art. » This is updated to simplify the previous rule, which separated time limits for kits vs apprentices. » For both, it is now two weeks. » Please remember to approach the artist politely about aging up your cats and to be patient. I will make more colorins of this for more adoptables, if an adoptable is crossed out then it's sold already. Ceolese - Semi Open Species - Registration Open! I've had these creatures for awhile now, and while drawing them on Oekaki I thought, 'Hey, why not make them into a type of semi-open species where people ask to be able to edit and then bam they can make their own and I can share these guys?' or something along those lines. You can use lock alpha for the coloring, but the edges are a little messy and I will fix that sometime later. I may still update this post later too. What are Ceolese? wrote: Ceolese is a form of cat with droopy ears and a long tail with a slightly fluffier tip. The actual cat is rarely seen, but tends to stay in the area of its shrine. Each cat has its own shrine, a block of (usually) concrete with a nameplate on it, and a sculpture made of the same material as the base shrine. Without a shrine, the cat does not exist. If the shrine is broken, the cat will be in pain and die if the sculpture is not fixed within a month. Once the shrine has eroded away or is broken after that month, the cat will die. If the shrine is kept in perfect condition, the cat will continue to live. Despite being determined if they are alive or not by the condition of their shrine, these creatures still enjoy hunting, eating, and drinking, just like a normal cat. Usually shrines can be found in human civilizations. Kits wrote: Young Ceolese can either be called kits or kittens. When it comes to a young Ceolese, it can get quite confusing. After a kit is born, they do not have a shrine, and usually live under the protection of another Ceolese. A kit, unlike adults, is very vulnerable due to the fact they don't have a shrine. Larger carnivores may find a Ceolese kit and attempt to hunt and eat it. A kit will get a shrine once it grows into an adult. I'm going to add this in now to avoid any confusion in the future: If the Ceolese is for adoption, the name on the shrine will usually be blank or say 'NAME'. It should also have 'Adopt me!' or something similar on the drawing, which can be removed once it is adopted. Failure to follow the rules multiple times will have you removed from the registered list. Have any questions? Feel free to ask here or through messaging me. I would like to be registered! TheLilLeopard wrote: I would like to be registered! You've been registered! Thank you! i accept DA points, C$, pets, art, etc. they have. Every so often a new one crops up. Their eyes really follow you everywhere, huh? Oh, no, I don't really know a lot about them, I'm just an intern here. I don't even get paid. know why they're shaped like guitars. Please stop asking me. Sam rifles through her bag from a minute before pulling out a disheveled piece of notebook paper. • Xurse may not be sold or traded. • Only artists and other approved staff can create xurse. • Xurse may not be edited. company of any greater number. Sam squints as she tries to read some smudged writing at the bottom. She trails off and shrugs. Nevermind. Doesn't seem that important. something truly amazing has happened here and i'm just glad i could see it. Why are you highlighting/quoting this? WHAT IS A FLIT? wrote: Shadow Flitz (Singular; Shadow Flit) are a long bodies species that have long since lost their hind legs, tail, and eyes to the power of the shadow and have replaced them with mold-able wispy appendages. these large, friendly beasts have been recently tamed to be ridden by humans and anthros alike. They have large, wide front paws, long pointed ears, and short, smooth fur. They can be naturally found in dark caves, wetlands, or thick forests. however have also been spotted in pastures while hunting. They are carnivores- meaning they are only meant to eat meat and they often prey on birds, deer, rodents, and bats. Here for the spring event? The spring event has started! you stumble though the edge of the rocky forest, looking down as your foot brushes against something besides plants. bending down to pick it up you find your hand grasping around a small... egg? a shadow darts above you, you look up in the attempt to see it but only manage to see a Shadow flit... flying? something is going on here! you spot more colorful eggs leading you farther out of the colorful forest and into the spacious flower fields. Another shadow zooms over the ground, then another! The small flying shadow flitz seem to be going to the same place? You follow them, picking up your feet and running through the grassy plains, you can feel the wind blowing past your ears, this felt so free! Almost like you were flying just like them! You find yourself climbing up a small hill, as you reach the top you look down to see all sorts of colorful Shadow flitz chatting and playing games! Some of the Shadow flitz are talking to the smaller, winged ones, they all seem like they're having a wonderful time! Why dont you join them? An Artist Competition is still open! An owner of the species is required to upkeep threads, manage staff, solve issues with the species, build events, and find ways to make the species stand out to gather more users. Their job does not require them to design/breed flitz but they are allowed to. A Moderator does not make designs at all. Their role is to watch the people, solve issues/confrontations and report back to the owner about any issues they might see. Archivists should be archiving the adopts, currency, items, tokens, and etc. they help keep everything up to date and easy to see. Artists are in charge of making designs and hosting/judging the competitions for them. their role is to provide new adopts for any users looking to gain a shadow flit and join/keep up with the community. Nursery artists provide designs for the species much like artists but instead of hosting competitions they focus on using two pre-existing designs to make a new one. All Rules must be followed by Group members, Adopters, Staff, Owners, and Outsiders! Shadow Flitz are a Closed Species; You cannot make a shadow flit without a "MYO" (make your own) Item or permission from the owner of the species *This rule has a FAQ! All Myos need to be approved by a permanent artist from shadow flitz. If a user is an artist for the species and wishes to get it approved it still needs to be publicly (not through pm) approved by another artist besides themselves. Warnings are issued based on a strike system. If a user breaks rules consecutively (up to three times) they will be punished accordingly. Respect and be nice to other community members whether they are staff or member, arguments must be taken to pm. Guilt tripping, actively complaining about not winning a competition, or trying to persuade another user to let you win a competition is not allowed. Bribary is also not accepted. *This rule has a FAQ! You may not sell a character that has come from this adoption center. to 'sell' includes trading a Flit for Chicken dollars, Deviantart points, CS pets, Furcoins, Treasure, Gems, Irl currency, etc. *This rule has a FAQ! If banned from the species, all characters under this center will be repossessed from the banned user and re-adopted/sold to the community. If you have recently changed your username please post an archive update form on the update thread so your username can be updated in the archive and someone doesnt try to steal your flits by using your old username! Shadow flitz can not be transferred out of the species. If the shadow flit was posted as an adopt, myo, custom, or etc from this thread series then it must stay as a shadow flit. *This rule has a FAQ! Do not steal designs or characters from this thread, if a design you made looks 'strikingly similar' to a pre-existing shadow flit you will be banned from the species. A User must wait 2 weeks after earning a free flit to be able to trade, or gift them. *This rule has a FAQ! A user banned from the shadow flitz species will have all of the shadow flitz listed under their name in the archive revoked and readopted. The moment the ban is put in place the user no longer owns the shadow flitz and can not gift or trade them, any attempts to do so will not count as a real trade. Not giving the credit to the adopt to the correct artist or atleast to the adoption center will be considered 'stealing a design' give credits where credit is due. A user can only win 4 shadow flitz a month *This rule has a FAQ! Only the original artist of a shadow flit or the owner of the species can approve edits done to a flit via 'store items'. *This rule has a FAQ! Do not beg/ask/imply that you want free pets, flits, art, etc. Not only is this already a chickensmoothie rule, we also really so not support this. Offering is different then asking for free. all staff members should be in the shadow flitz discord chat to be able to talk to their fellow staff. Any major updates or discussion will be posted there and will need to be seen by all staff. > The 'Staff myo token' can include up to 15 edits of any type. Nobody can approve their own myo(s). Every flit made should have a list of their edits in the post below them- to avoid confusion for the nursery and future transfers. A mod must be active within the community. If they need to take a break longer then a week, let the species owner know. They must be able to deal with conflicts in a peaceful, and non-biased, non-harsh manor. A mod should be willing to speak for the community if it is needed. Moderators receive 1 staff myo token every month they are active in the community. A moderator can issue a warning at any time (to staff or members!) but must tell the other moderators as well as the owner of the species when they have issued one (in the mod chat is the best place.). If a moderator deems it necessary to ban an offender they should discuss it with the owner and other moderators first. These are the Rules and Guidelines for permanent general Artists! Permanent Artists must make a minimum of 4 designs monthly to be considered active, exceptions should be asked about in pm to me. If an Artist fails to make their minimum number of designs they will get 1 warning at the end of the month. They will have 2 weeks to finish atleast 4 designs, if they do not finish the designs they will be removed from the staff and will need to try out again during an artist competition. An artist will be allowed a maximum of 2 weeks after their adopt contest had been closed. They will be given 7 days to respond after the 2 weeks. If they don't respond, the adoption will be confiscated and will be judged by another artist within 7 days. If this happens, the artists' Custom will be given to the artist who judged the competition as punishment. This position does not include being a Nursery artist, that role is now separate. However one user can be an artist and a nursery artist- but the role will be considered two separate roles. *This rule has a FAQ! It is not up to an artist to stop an argument or issue warnings, an artist can only tell a moderator or the species owner of things like that going on. An artist can make as many paid adopts as they would like as long as they understand that the paid adopts do not count towards the staff myo token or their 100 adopt myo. As of 3/13/2019 the deviantart page is Inactive, artists should not post adopts there and should instead post them in the discord adopts thread in the discord channel. If an artist makes a discord adopt they must also mention in the "discord adopt staff-chat" channel to announce an adopt has started. when the adopt has ended and a winner has been chosen the artist must post in the "discord adopt staff-chat" announcing who has won to the archivists. Nursery slots may not be sold for any currency. A Nursery artist can not be an owner of a flit in a breeding slot claimed by themselves unless a staff myo token is used. If a user is a nursery artist and they do a personal breeding the flitz from that breeding can count towards their staff myo token and their 100 adopt token. This rule is only allowed for nursery artists personal breedings do not count towards tokens for general artists. Permanent Nursery Artists must claim and finish a minimum 2 nursery batches a month to be considered active, exceptions should be asked about in pm to me. Artists do not need to show screenshots of the generated number, no matter what any other user says. They can but do not have to. It is up to the artist to grow the flitling from the nursery batches they have done. This rule is in place because more often then not an artist will know how to replicate their design better then a newcomer. a growth does not need to be approved, however if something is pointed out to be missing then the artist should fix it. The growth for a flitling should be a 'colormein' of the original nursery batch. After a flitling is grown the archivist should be notified, a link should be included. a flitling must be grown in order to add a store item to it. "Special batches" ('50s & '00s) should be discussed before you do them- if you would like to do one please ask in the staff discord chat. These will be reserved for orphan adopts. This position does not include being a normal artist, that role is now separate. However one user can be an artist and a nursery artist- but the role will be considered two separate roles. *This rule has a FAQ! It is not up to a nursery artist to stop an argument or issue warnings, they can only tell a moderator or the species owner of things like that going on. If a nursery artist has opened slots for a breeding however no tickets have been filled out within the month that artist will not be penalized for not finishing any breedings. An Archivist must be willing to update the archive when they can. while the archive does not need to be updated instantly every time, the archivists should atleast be updating monthly. Guest moderators get to try out for up to 1 month. Guest moderators can earn 1 staff myo token at the end of their trial if they have been active. Guest artists have 1 month to do up to 8 designs if they do not finish the 8 designs in the month they do not get to finish the remaining adopts. If they finish 8 designs by the end of their guest month they will earn 1 staff myo token. Guest artists can not sell any adopts. guest nursery artists have 1 month and can claim up to 4 nursery tickets, if they finish 4 tickets by the end of their guest month they will earn 1 staff myo token. After a trial the guest staff should pm the species owner and explain what they had done during their trial period. After a trial the current mods and owner will discuss whether the guest nursery/artist/moderator should be moved to the permanent position, if they don't get the position the guest will be pmed by an owner or moderator and told so. Major complaining from a guest staff is not tolerated and will be treated as "actively complaining about not winning a competition"
All guest staff must follow the rules of their permanent counterparts. All rules can be changed at any time. accept and will follow all rules here. Ban/Warning Explanation wrote: Breaking a rule results in a strike. Major faults may lead straight to ban or multiple strikes given out, such as severe harassment. This is just the location for the form layout and coding so users can better find it. do not post your appeal form here! If you think your ban or warning was unjust or a jump to conclusions, or if your ban/warning was a long time ago and you'd like to announce yourself as a different, changed person... please fill out this form and pm it to scei. >>>> A User must wait 1 month after their original ban or warning to be able to appeal. >>>> A User can only appeal for a warning once a year, despite how many warnings you have. >>>> A succeeded appeal will remove one warning from your account. if you had been banned, you will be unbanned, but still have 2 warnings, the only warning removed will be the one you managed to appeal. >>>> If you become unbanned your flitz/items/etc will not be returned to you. you are welcome to try to trade the new owners for the flit, but consistent bugging or asking for them for free will return your account to a ban. >>>> Fill out the appeal code for only one of your warnings, not all of them. Ravenfall is a closed wolf rpg/adopt. It’s focused on character design and world building through art, writing, rp, and many other methods. Currently we are not open to the public. Information wrote: The snow laden Ravenfall mountains are a central feature of the territory, large, imposing black mountains that spread over a large range. The land is far to the north where snowfall is common most of the year. Winters are harsh and white, but a few hot springs add a spark of color and heat to the frigid landscape. Wolf packs roam large swaths of land in the mountains, removed from the prying eyes and spears of human. There are a few human villages near the mountains, but they are small and warded with flames. Most wolves consider the humans a force opposed to nature, an annoyance. Hunting parties, however, are to be feared - a wolf has nothing to fear form one man, but a group of them, with hounds, are another story. The wolves of Ravenfall have lived here for centuries, far longer than any living wolf can remember. The older wolves often share legends of the gods and the ancient. Harassment and other negative behaviors are not tolerated. Wolves have realistic/near-realistic coat colors and realistic eye colors, those eyes may not match the coat. Colors include: white, cream/blonde, ochre, gray, browns, blacks. Wolves in Ravenfall typically have litters of 3-4 pups, though not all may survive due to the harsh weather. Packs are named after their current leader. I.E. Túndra’s Pack. Most packs have at least one Jarl and a handful of other wolves. Newer packs start with less and get more over time as their Jarls have pups, but beyond this there are currently no hard rules for limiting the number of wolves in a pack. Each user can have one pack. Wolf packs have straightforward ranks, though your pack may have a few other specific ones. Seer: Devoted to and communicate with the gods(0-1), part of a pack but often live alone. Sometimes healers. Names are nature themed and can be in various languages. Icelandic is commonly used.